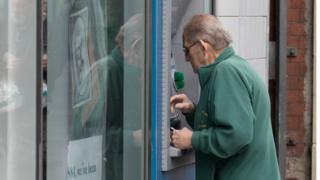 Cash machines must offer a wider range of services to prevent communities dying when their last bank closes, an expert has said. Since 2010, the four main banks have closed 193 branches, according to figures obtained by BBC Wales. 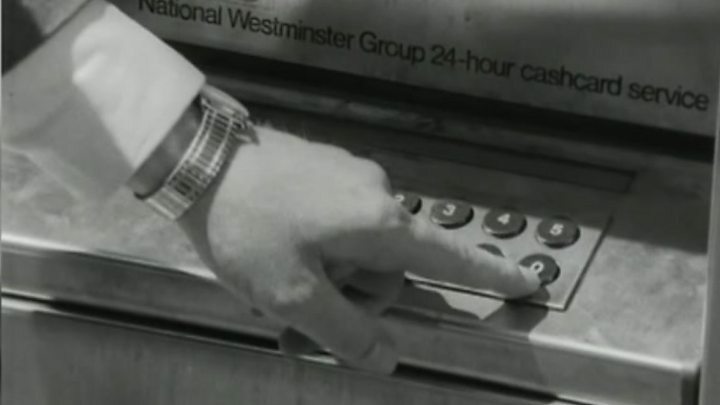 Fifty years since the first UK cash machine launched, banks said they were adapting to a rise in online banking. But Ron Delnevo, of ATM Industry Association (ATMIA), said without access to cash "communities could die". Can a 'bank in a box' replace a branch? Media captionWhat did shoppers make of cash machines when they were first launched in 1967? The Federation of Small Businesses (FSB) said independent businesses relied on banks for services, and poor broadband in rural parts of Wales made it difficult for people to manage finances online. In comparison, since 2008, the number of cash machines has risen from 2,660 to 3,223 - up 21%, according to figures from cash machine network Link. What happens when the last bank in town closes? Mr Delnevo, ATMIA's executive director for Europe, said while banks were pushing for people to go digital, many transactions were still cash-based and businesses needed access to services to survive. He said cash machines needed to provide more services - such as paying in, cashing cheques and offering financial advice - to help communities who have been, or will be in the future, left without access to a bank. "The trouble is with bank branches closing, we are then going to see communities crushed," he said. "We know that people then go elsewhere to get cash out. It is very important that we do not see dead communities, places where people just sleep." In Dubai customers can withdraw gold from ATMs; in South Africa they are used to take out funeral plans; in Spain to pay property tax; in America stamps can be bought; while in Portugal applications can be made for fishing and hunting licences. But Mr Delnevo said the range of services offered by ATMs in the UK was still very limited, with the terminals synonymous with cash withdrawal. He said they should instead expand to become multi-purpose ATMs with facilities for depositing cash, similar to some other countries. "Just because a bank isn't there, it doesn't mean that the community shouldn't have access to cash and other services," he said. "We can't argue with the banks, they want to go digital, but people aren't ready for it. " The banks said while the decisions to close branches were not taken lightly, demand for traditional branch-based services was falling. Many traditional services can still be carried out at Post Office branches, through a partnership with the banks. What happens when the town bank closes?